A comprehensive system of legal research for decisions of the federal courts of appeals and district courts. For pricing or to place an order, please contact us at 1-877-394-8826. Shepard's Federal Citations provides a comprehensive system of legal research covering the reported decisions of the federal courts of appeals and district courts. Your annual subscription keeps you up to date on the latest case law with the same Shepard's content attorneys have trusted for over 40 years, available only from LexisNexis. 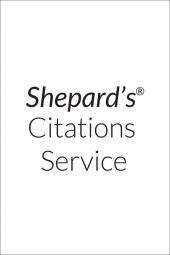 Shepard's citations mean you can quickly and easily look up the subsequent treatment of a case and research with confidence knowing whether it has been cited by other decisions, overruled or otherwise modified, and whether it has been "explained," "distinguished," or otherwise received a Shepard's editorial treatment letter. No matter what areas of law you practice in, don't be without Shepard's Federal Citations when you handle Federal issues.